International relations (IR) theories have been utilized for almost a century and now questions are arising about developing non-Western IR theories. On April 25, the international symposium “Global IR and Non-Western IR Theory” was held in Beijing. Scholars conducted in-depth discussions on narrowing the theoretical gap between Western and non-Western IR theories and constructing Chinese IR theory. Participating scholars all agreed on the importance of bringing down barriers of Western centrism and building a more inclusive and universal discipline of IR studies on the basis of dialogue. Peter Katzenstein, a professor from Cornell University, said IR theories must reflect this diversity of the world. He said that there is no single model for the development of different countries and regions in the world, and multiple modernities mean different cultural expressions in the same context. “Western” and “non-Western,” as well as common and tacit forms of knowledge should not be viewed in dichotomy. 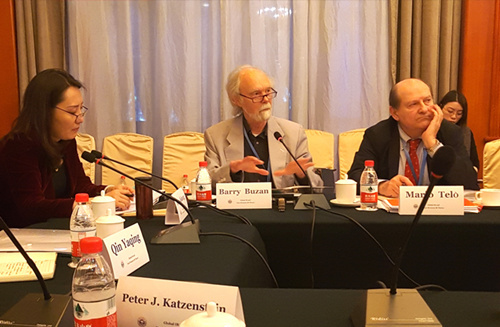 Barry Buzan, emeritus professor of IR from the London School of Economics, said the existing mainstream IR theories are only abstract concepts intertwined with Western history and political theories. For example, the theory of realism is an abstract summary of European balance-of-power structure and the ancient Greek political philosophy from the 16th to the 18th century. Liberalism comes from the inter-governmental practices and theories of political economy in the 19th and 20th centuries. The English School is an abstract summary of European diplomacy and legal ideas in the 19th century. Constructivism, though not obviously sprung from Western practice, is still born out of the Western philosophy of knowledge. One of the major practices in Western IR theories is the generalization of Western history and political theory into world history and political theory. As long as Western countries maintain their global dominance, this myth is easy to maintain. However, with the gradual modernization of non-Western countries, this myth has begun to burst. Buzan discovered by examining the development of the IR theories under the center-periphery framework that while the current Western IR theories still dominate, in recent years the IR theories in marginal regions have developed with momentum. Mario Telò, an academician from the Royal Belgian Institute of Natural Sciences, said that self-criticism within the American IR theory circle, the split between European and the US IR theories, the development of comparative regionalism and inter-regionalism, and the rise of post-hegemonic multilateralism offer conditions to build diverse, innovative and non-Western IR theories. IR theories in China, as well as in Asia, Africa, North America, Latin America and Europe should all flourish, providing tools for understanding and improving global governance. In recent years, the “relational theory of world politics” proposed by Qin Yaqing, president of the Institute of Foreign Affairs; the Tsinghua Approach proposed by Yan Xuetong, president of the Institute of International Relations at Tsinghua University; and the theory of Tianxia proposed by Zhao Tingyang, a research fellow from the Institute of Philosophy of the Chinese Academy of Social Sciences (CASS), have all attracted broader attention among the international academic community. Yuan Zhengqing, a research fellow from the Institute of World Economics and Politics at CASS, said that although there are significant differences in the paths and methods used by different Chinese scholars to construct IR theories, one common feature is that they all return to Chinese history and culture to absorb nutrients. In analyzing the important role of culture in the construction of theory, Qin said the theoretical core includes both physical and metaphysical factors. The physical elements help members of a cultural community observe facts of experience, while metaphysical factors help them understand and interpret these facts. Culture forms the metaphysical factors of the cores of these theories. Any social theory will always have a cultural birthmark and culture is an important source of theoretical innovation. Mainstream Western IR theories draw resources from Western culture in a highly implicit and abstract way. “Individual reason” is a metaphysical factor shared by structural realism, neoliberal institutionalism and constructivism; Chinese scholars are also seeking inspiration from traditional Chinese cultural resources. The notions of Chinese traditional culture such as wuwai (no foreignness), daode (morality), and guanxi have been highlighted in the construction of Chinese IR theories. Amitav Acharya, distinguished professor of IR from American University, said traditional Chinese culture is one of the oldest and most developed cultures in the world. The attempts of Chinese IR scholars to extract nutrients from them have expanded the base of world history of IR theories, increased the diversity of international relations theory, and helped surpass the Western centrism of traditional IR theories. Yan said that merely interpreting an event that occurred under a particular historical condition cannot be called a theory, and that the theory must have explanatory power for similar events occuring in the world. Chinese scholars’ IR theories should be guided by the interpretation of universal issues in international relations and try to pursue as much of the explanatory power of theory as possible.